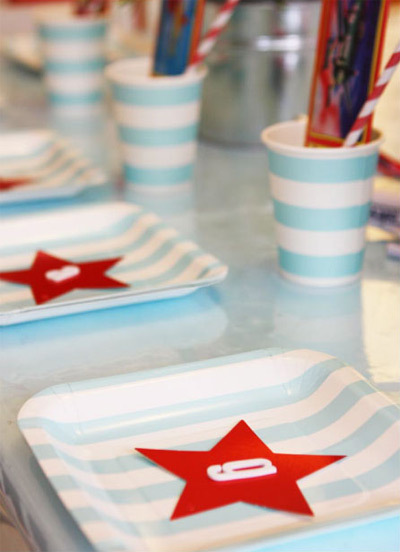 This glorious airplane and star-themed birthday party comes to you from party expert, Kate from party stationery and accessories company Sambellina. You know the one! 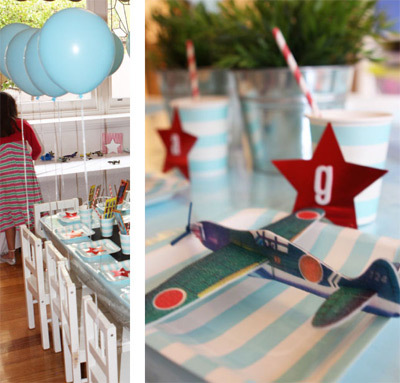 Kate used her airplane invitation as a starting point for the colours and decorations and created an aviatory masterpiece for her son Christian's 4th birthday party. Enjoy! Birthday: Christian's 4th Birthday Party. A very small indoor "do" with family, his cousins and a couple of his very closest friends. Organised by: Mum Kate (from Sambellina). 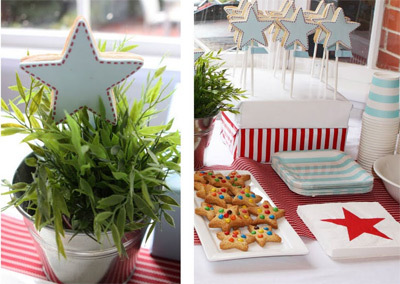 Party Food: Cupcakes and star cookies by Kiss Me Kate. 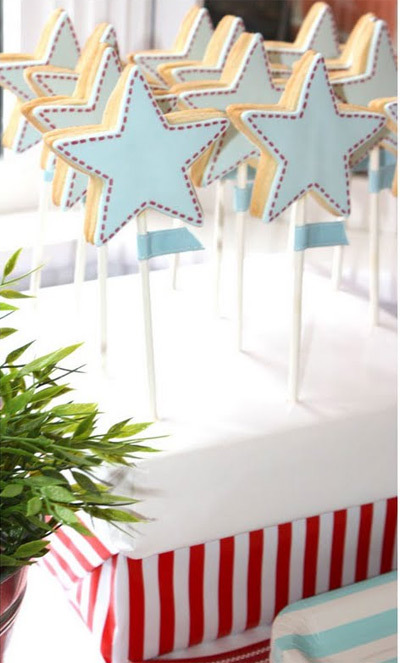 The hero of the party were the amazing baked goodies custom made by Kiss Me Kate Events. I could gush all day about how beautiful the cupcakes and cookies were. I gave Kate a small brief and our custom designed invitation, and look at how perfectly matched these gorgeous cupcakes are!!!!! They were like little art masterpieces too good to eat, but all reported they tasted as great as they looked. Kate is an artistic baking genius. 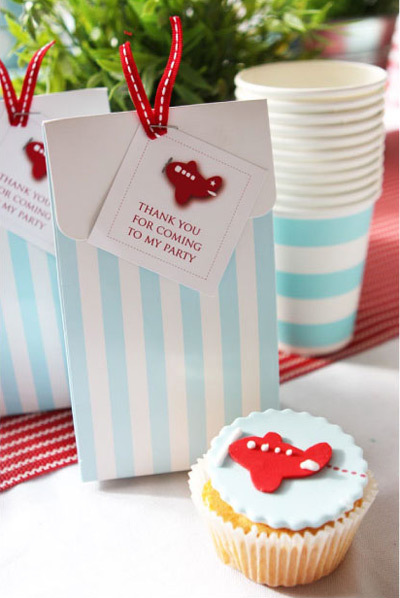 Decorations: Star serviettes and retro styrofoam airplanes from Love To Celebrate, Partyware and Treat Boxes by Sambellina. 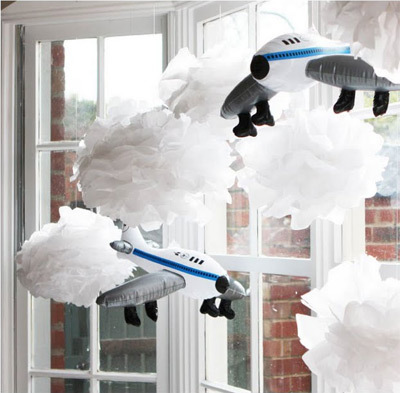 Handmade tissue pom poms as clouds. They were somewhat amateur but who says clouds need to be neat. Check out the Martha Stewart tutorial - easy peasy. 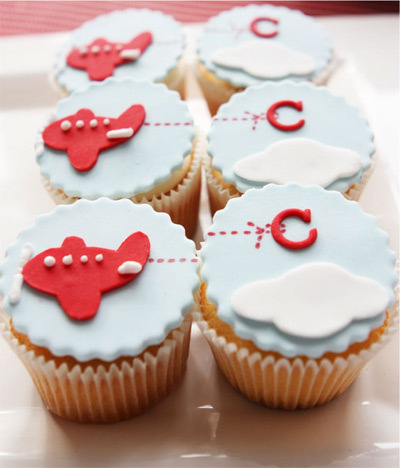 I would also like to mention the enormous generousity of Gaby from Love To Celebrate in Roseville, NSW who sent me samples of styrofoam aeroplanes and aircraft party favours to make it so easy to theme everything up. The aeroplanes were great for our indoor air races (to a Top Gun soundtrack of course)....and the kids had fun making them up ready to race. Thank you Gaby !! Tips: A little party table with helium balloons. Kids really do love to find their initials and their personalised place before devouring the party food. We had a little blackboard runway in the middle of the table set out with some of Christian's massive aeroplane collection. Something special: The best part of a party to me - is the building excitement for the birthday boy (and his big sister, event planner Miss Sambellina herself) in the party lead-up. We had so much fun preparing the treat bags together, making styrofoam aeroplanes, setting up the party table and planning the entertainment and games. I love how completely absorbed and involved they both get with their birthday parties. Being simple and small, it was a lot of fun to put together. Thank you so much Kate for sharing your party with us. 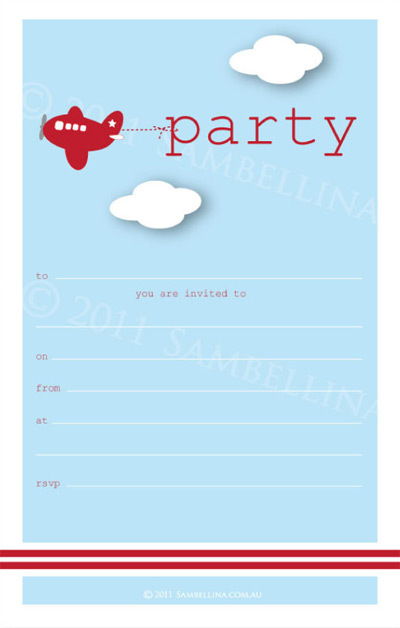 For more info on the party see the Sambellina blog and head over to the Sambellina website for gorgeous partyware and stationery. Gorgeous colours and such a simple fresh theme.